Conveniently located on the outside of the unit, standard high-efficiency coolers provide maximum cooling resulting in low approach temperatures for more moisture separation at the compressor discharge and better air quality. A filter mat simplifies cooler maintenance. Dirt and dust build up on the outside of the filter, where it is easily seen and removed. This extends cooler service intervals and increases thermal reserve for harsher conditions. Kaeser’s power-saving, proprietary airend design delivers pressures up to 217 psig. Our newly designed airends are precision-machined to close tolerances and optimized in size and profile to match the low airend speeds with their best specific performance. Manufactured according to strict quality standards and supported by precision-aligned roller bearings, these airends guarantee long operational life and outstanding reliability. High-efficiency, totally enclosed, fan-cooled (TEFC) motors with Class F insulation are standard for long life in harsh environments. Tri-voltage 208-230/460V or 575V, 3-phase, 60 Hz is standard. Other voltages are available. Magnetic Wye-Delta reduced voltage starters ensure low starting current and smooth acceleration. A three-stage separator (ASME or CRN) combines centrifugal action and a two-stage coalescing filter to reduce fluid carry-over to 2 ppm or less. Quick-release fittings, drain and fill ports are arranged for fast and easy fluid changes from sump and cooler without any pumping device. The easy-to-read fluid level indicator can be checked without opening or stopping the compressor through a window in the service panel. Kaeser’s new Sigma Control Basic is a simplified, PLC-based controller. Designed to monitor primary compressor functions and display basic operational data, Sigma Control Basic is an exceptionally cost effective choice for small to medium sized facilities with a single compressor. Sigma Control Basic is standard on Kaeser’s SX, SM, SK and AS series rotary screw compressors. It is the perfect solution for single unit installations with straightforward control requirements. Sigma Control is available as an option on these units and is recommended for multiple unit installations. Debating between a piston unit and a screw compressor? The duty cycle of our rotary screw compressors allows the compressor to run up to 100% of the time. There is no need to over-size your compressor to allow for cool down. There are no pistons or rings to wear out. More consistent pressure means you do not waste energy running 30 to 50 psig above your required pressure. Aftercooler removes 80% of the moisture. Lower oil carry-over (90% less than piston units) contributes to better air quality, even without the built-in dryer option. Rotary screw units have better product quality and much less scrap. Kaeser screw compressors have less equipment maintenance and far longer tool life than with piston units. 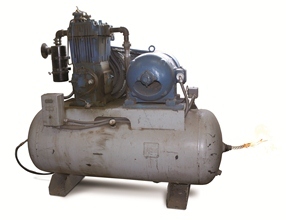 Kaeser screw compressors offer more air per horsepower, reducing your energy costs. 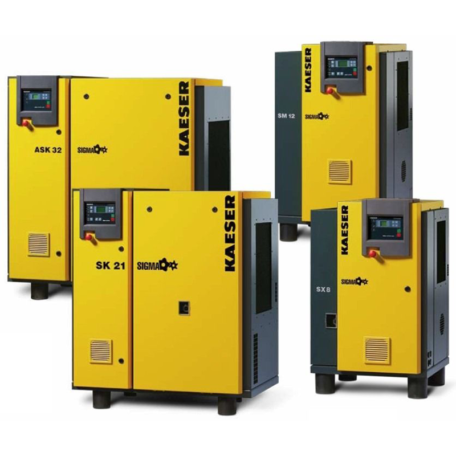 Kaeser screw compressors are quieter than piston units, allowing a quieter work environment and more flexibility in installation.